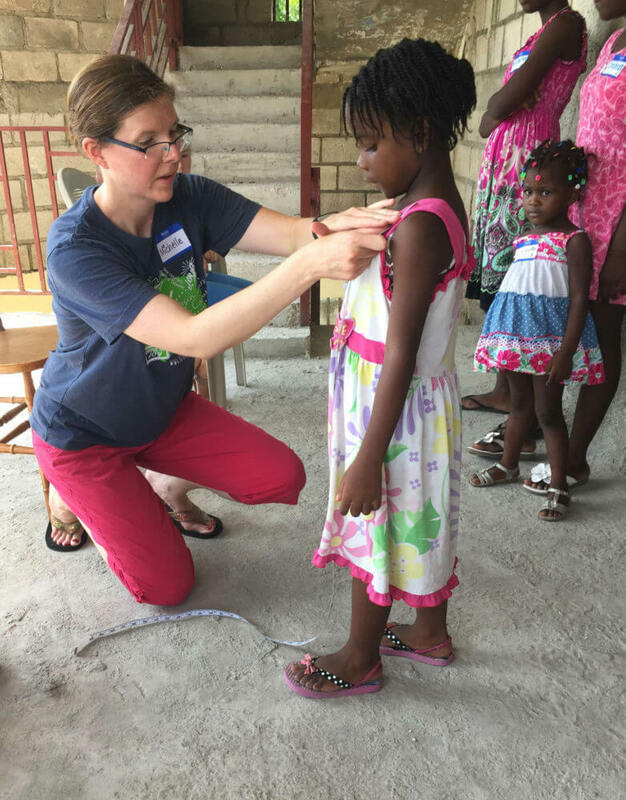 As we celebrate the coming of our King to earth this month, I think I am finally ready to put into words some thoughts about our trip to Haiti this past July. Ms. Vicki, my dad, my oldest daughter, and I made a trip with a team from Joy in Haiti, an O’Fallon-based ministry organization. We had the privilege of spending 9 days in Haiti doing various things with the House of Joy Orphanage and the New Christian Church & School of Tabarre. Following God’s leading to make this trip, I went in open to receive whatever God had for our team as well as the Haitians we had the privilege of meeting there. I was overwhelmed with the joy the girls shared with us. 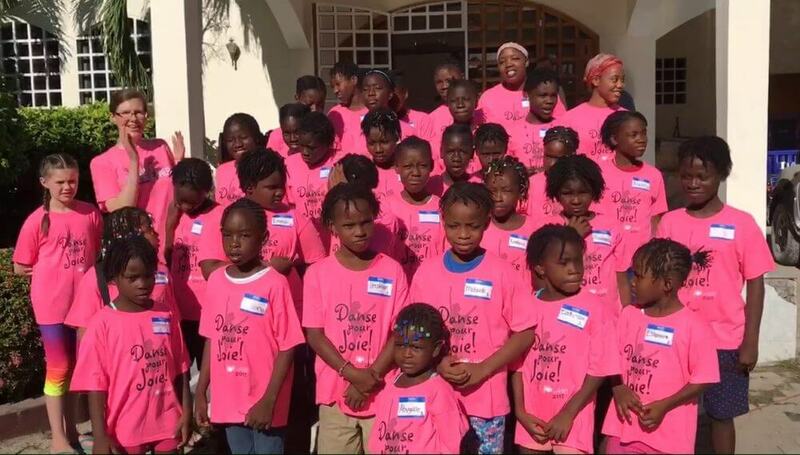 Teaching dance to girls who do not always have the opportunity to learn like this was a joy. Many of the girls were full of energy and loved tumbling. Many of the girls enjoyed expressing themselves through dance as well. They soaked up the instruction like sponges – never complaining about the 100 degree heat (indoors) or feeling tired. They were excited when we were wrapping up the learning of the dances, and it was time to prepare for dancing at Sunday’s church service. Handing out costumes and taking group photos was a treat – similar to dance concert time here with excited girls who love dressing up! There are a few girls from the orphanage who do the hair of the other girls, and it was a fun surprise on Sunday to see that they had coordinated their hair ribbons and ponytail holders to the ribbons of their costumes. The girls did a wonderful job shining for Jesus during church that Sunday morning. Late in the week, our team had the opportunity to take a day trip up into the mountains with a few of the girls from the orphanage. The girl that we sponsor, Dieudena, got to come with us that day. We took a very bumpy ride to visit a Baptist Mission, had lunch, and then went on to see a defunct castle that served as a battlement for the Haitians during a time when they wanted to protect themselves & their freedom from slavery. It was interesting to learn some of the history of Haiti and to see more of the country. Traveling through the country takes a lot more time than it would here in the U.S., and trash is seen on most of the streets. Goats walk the rocky streets, people line the main roads selling basic necessities (toothbrushes, deodorant, etc. ), and most parcels of land are surrounded by cement block walls topped with barbed wire for safety. Buildings are painted with vibrant colors, there are colorful “tap-taps” (taxis made from benches lining the covered beds of pick-up trucks), and there are no street signs or traffic lights. 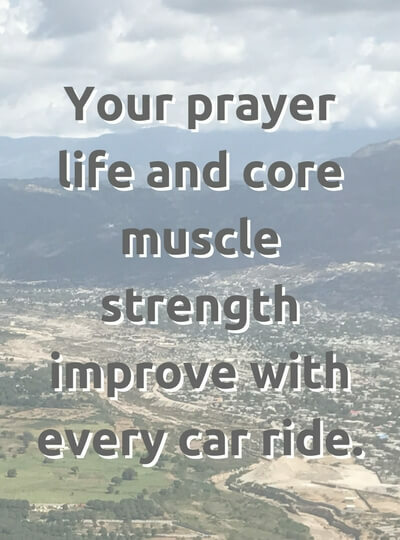 Your prayer life and core muscle strength improve with every car ride. The people there are in great need of prayer as well as the confidence to be able to care for themselves, their community & their country. Prayers for their government and infrastructure are priceless. Haiti is full of so many people who have suffered much hardship and yet exude joy, resilience, and hope. I left a piece of my heart in Haiti with the girls when our plane took off at the end of the 9 days. Both Ms. Vicki and I were crying as we watched the island get smaller and smaller from our windows in the plane. And then we noticed a rainbow in the clouds over the country – God’s sweet reminder that He is sovereign in all places and in all situations. Although I was thrilled to be coming home to the rest of my family, it was hard to return to such luxury, provision, and more rigid schedules. Plus, I was freezing in the air conditioning – lol! I have heard from others that this transition is normal, especially after being somewhere so different from home. Dancing for Jesus with girls who call the orphanage their home is a humbling experience that has impacted the way I view life. 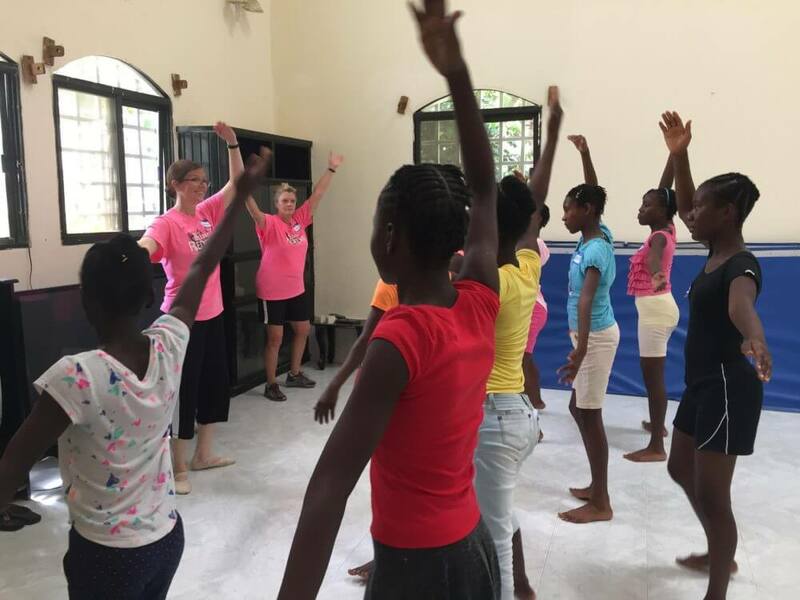 Some of the girls have no family, and some do have family members in other parts of the country, many of whom are displaced from a hurricane or earthquake and cannot care for the girls. Most have stories that will break your heart. But all of them remind me of our kiddos here – full of life, joy, peace, laughter, hugs, and love! They have smiles that will melt and capture your heart. Please remember them in your prayers when you think of them! I am thankful for the life of each girl as we celebrate the life of our Savior. I give thanks for the church, school, & orphanage, along with the ministry of Joy In Haiti contributing to the well-being & provision of these precious gifts of life! 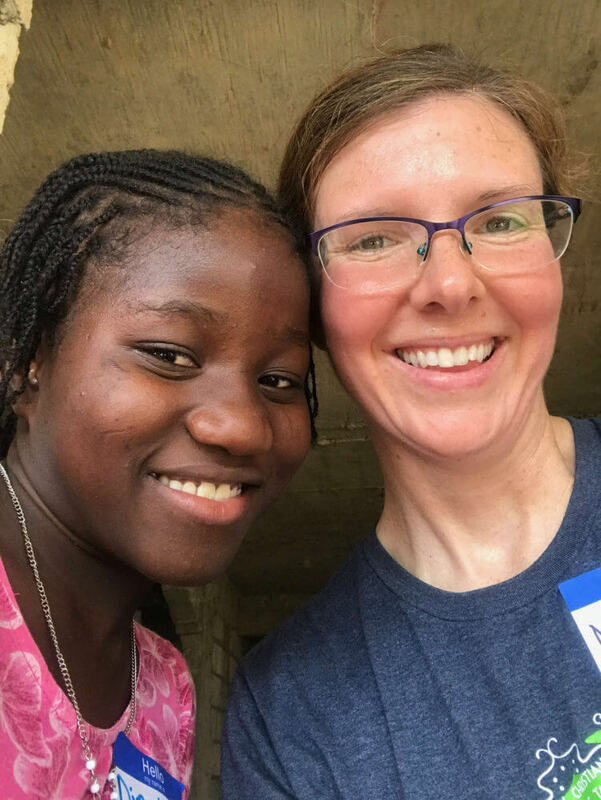 Click here to learn more about Joy In Haiti – There are two new little ones that we met this past summer who may still be in need of sponsorship as well!